This month’s assignment was from Everyday Insanity. I was excited when I received Cindy’s blog as my assignment. We have very similiar styles of cooking and I loved seeing all the posts about her grandkids! I chose her Beefy Macaroni Skillet recipe. It’s a quick, one pot meal which is great for any busy family. I swapped out the ground beef in the original recipe for ground turkey. In a large skillet, brown the ground turkey and onion. Drain any grease from the turkey. Stir in the tomatoes, water/juice, salt and pepper. Bring to a simmer. Add the pasta and return to a simmer. Reduce heat to low and cover and cook for 12-15 minutes until pasta is tender. Stir often to keep the pasta from sticking to the bottom of the pan. Add the corn and heat through. Top with shredded cheese if desired. Want to join The Secret Recipe club? Stop by Amanda’s Cookin’ and join the club! Love it, this recipe brings back memories from my childhood. Glad you liked this recipe. Whenever I ask hubby what he wants for dinner it's this recipe! Pure comfort food, and the leftovers make a great lunch. Thanks for the kind words about my blog. I'm excited to take a look at your blog! Have a great day. I love easy skillet meals like this! This looks like something my family would love! Sounds like a quick, flavorful, one dish meal great for a busy weeknight! What a great and easy meal. Looks easy enough! Glad to be part of SRC with you! 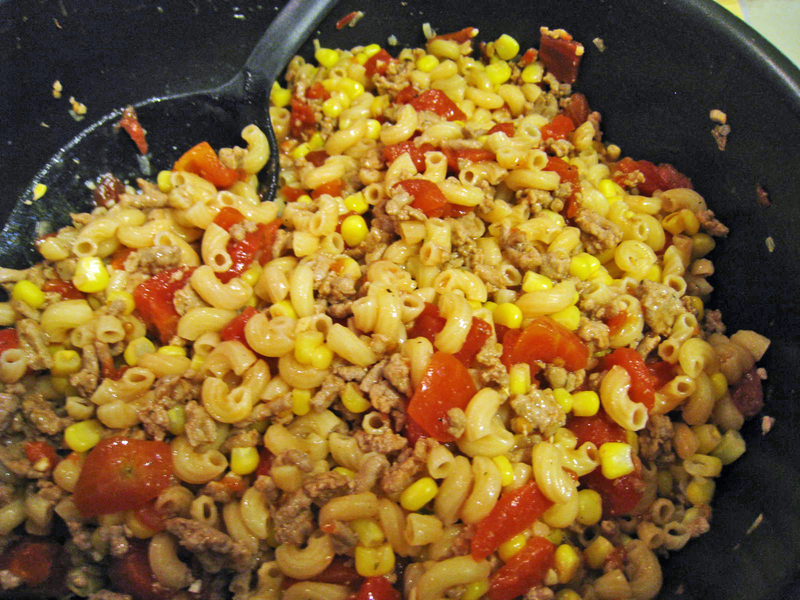 This skillet macaroni is such a great meal! So fun to be in the Secret Recipe Club with you.